Iam loving all things Ridhi Mehra these days, it is safe to say iam having a designer crush on her. I was first introduced to her designs by sonam kapoor who wore a beautiful floral anarkali for promotions of her movie. Ever since iam smitten to her breezy floral craftsmanship which is stuff dreams are made of ..
Ridhi Mehra at 24 has tasted fabulous success in the fashion scene with celebrity names like Sonam kapoor, parineeti chopra and madhuri Dixit sporting her label . Ridhi Mehra creations have an old world charm to it while she attempts to mix European influences with indian aesthetics. What I love most about Ridhi is her fresh and chic approach to traditional wear making her creations an ideal wear for the woman of today. Her signature embroidery placements and attention to intricate details is something which sets her apart from other mainstream designers.. Ridhi sticks to floral embellishments and embroidery along with flouncy drapes which gives her creations a very feminine touch . Her designs are modern and light unlike most Indian designers who churn out heavily embellished stuff this makes her designs a hot favorite with the young crowd. If you are looking for something fun and effortless yet indian to wear for a wedding Ridhi Mehra could be your pick.. Her floral crop top paired with a plain lehenga is an instant hit this wedding season. 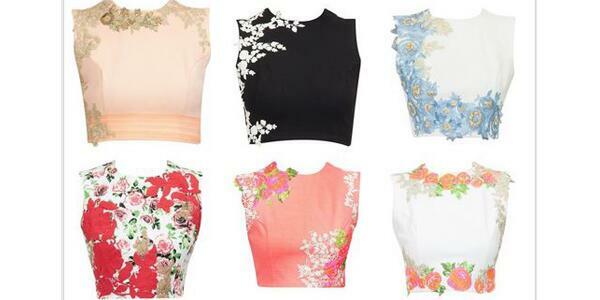 Infact her crop top is a kind of an investment which could be worn in several different ways. See how parineeti Chopra paired the black crop top to with a skirt while the mannequin wears it with a saree? The same crop top could be worn even with a lehenga , plazzo pants or even your jeans how effortlessly multipurpose is that? Ridhi Mehra crop top lehenga would be an ideal thing to wear for a bride on her mehendi, what with it being sleeveless so no chance of mehendi being ruined by sleeves and the lehenga would provide right amount of flare if a little dancing is involved. Do you love ridhi mehra creations as much as I do? please share your thoughts! Ethnic earrings : Trend alert for ethnic wear! Easy fashion hacks every woman must know! Dove Elixir hair fall rescue hair oil review. Lust Vs Must : Fuchsia outbursts! Dr Batra’s face wash with tea tree oil review.